James Baldwin’s bracing “Blues for Mister Charlie” — dedicated to his murdered, civil-rights-activist friend Medgar Evers — gets a stirring production in Seattle churches and high schools. In the upstairs foyer of Emerald City Bible Fellowship church, just a quick walk down Rainier Ave. from the Othello light rail station, you can find a list of Christian jokes on a laminated wall poster. Running, soul-searching, death: As audience members walked past the poster and into the church’s nave (bare, except for a purple flag with a white cross), the jokes had an eerie resonance with the powerful, occasionally shout-provoking production that was about to begin. Sept. 14-17 by The Williams Project, next performances at Franklin High School, 3013 St. Mt. Baker Blvd., Seattle; $0-$50 (thewilliamsproject.org). 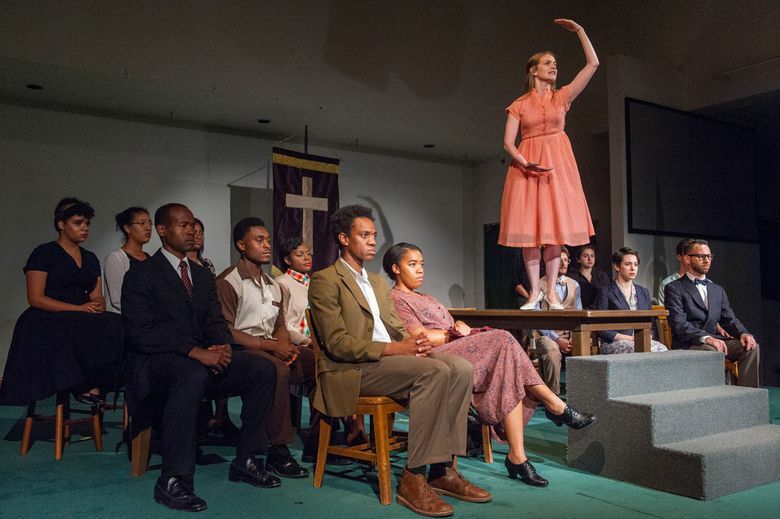 Unlike, say, watching a Samuel Beckett production with a crowd of silent people in the dark, the audience at James Baldwin’s “Blues for Mister Charlie” could watch and hear each other react to the 1964 play about race and violence in a small Southern town. And when the characters delivered gut-punching lines about racism and injustice, they got some earnest “amen”s. The audience felt more present, more invested, than any I’ve sat with in a long time — and it gave the performances extra fire. Baldwin dedicated “Blues” — about a young African American man gunned down by a white supremacist in a small Southern town and the subsequent trial that put a magnifying glass on the community’s racial rifts — to his friend Medgar Evers, a civil-rights activist assassinated in Mississippi, plus Evers’ widow and children. “Blues,” with its spare staging but excellent performances, inspired a wide spectrum of emotion from the audience. The white people tended to sit silent and intent, leaning forward in their chairs; older African American women (some with reluctant-looking teenagers in tow) reacted vocally. For some it was theater; for some it was church. But nobody seemed unmoved (except one teenager who seemed more interested in his cellphone). A little historical context for “Blues”: In 1955, a 14-year-old African American kid named Emmett Till was dragged from his bed in Mississippi, mutilated and murdered by some white men who thought Till had made a pass at a white woman in a small-town store. Medgar Evers and other Mississippi civil-rights organizers got involved, disguising themselves as local cotton pickers to dig up information. In 1963, Evers was shot in the back by a white supremacist — who wasn’t convicted until his third trial in 1994. Though I don’t know if Freire saw “Blues,” that thought runs like a deadly undertow through the simmering outrage of “Blues.” Leicester Landon expertly plays the white killer as a chillingly naive, laughing, rooty-toot, bourbon-drinking, I-ain’t-got-nothing-against-them-people-but-I’ll-be-damned-if-I’ll-mix-with-’em small-town bigot. He is the play’s most casually dehumanizing — and, as a result, dehumanized — character. Everyone else is stricken by the ugly fruits of racism. But he’s just a grinning, murderous idiot whose what’s-the-big-deal? tone turned my bowels to ice. Other performances were equally stirring: Rafael Jordan in his scorchingly stately grief as the preacher-father; Brenda Joyner as the killer’s bewildered wife who lies on the stand to save her husband; Max Rosenak as the agnozied, white, hard-drinking journalist failing to bridge the gap between white and black and unable to bear the strain; Ryan Williams French as the Till/Evers composite character, who is so vibrantly joyful when talking to his friends but so righteously pissed off by white folks, he looks ready to bust at the seams; Reggie D. White, who plays his young character like a fuming Stokely Carmichael, but is warier about antagonizing the white racists than his friend who gets shot. As Baldwin was writing “Blues,” Americans were debating whether civil-rights activism was better served by nonviolence or more openly aggressive tactics. The play’s final, poetic image feels like Baldwin’s prophecy for the Mister Charlies of the world — as early American revolutionaries knew, the two aren’t necessarily mutually exclusive. Watch for the moment when the Bible nuzzles the gun.